Today, I'm beginning Agnes for the Summer Sweater Knitalong. I've been wanting to make this for I don't know how long. 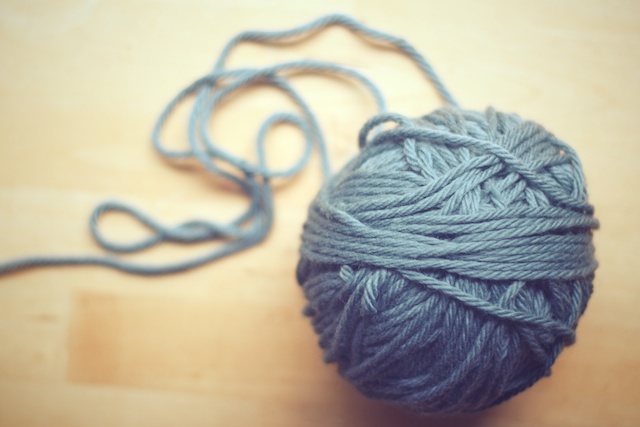 It includes several things I love: bulky yarn, larger needles, and a soft blue color. I would have knit this even if the styling of the pattern photos wasn't so cute; but it is and so now I must. I'm using Knit Picks Wool of the Andes Bulky in Cadet that has been waiting around in zip-loc bags for a year. So, here it goes. I took swatching a little more seriously with this sweater, knitting a faux in the round swatch like Ysolda mentions in her book. I didn't take it so seriously that I knit a full 4 inches in length, but I think I got the idea. 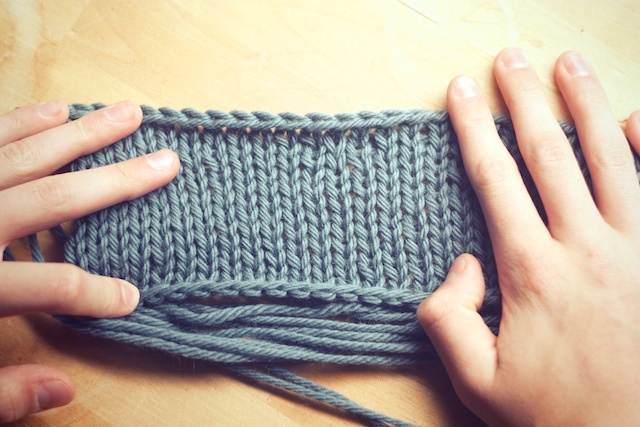 The point with this swatch is to mimc knitting in the round by using only knit stitches on your stockinette. 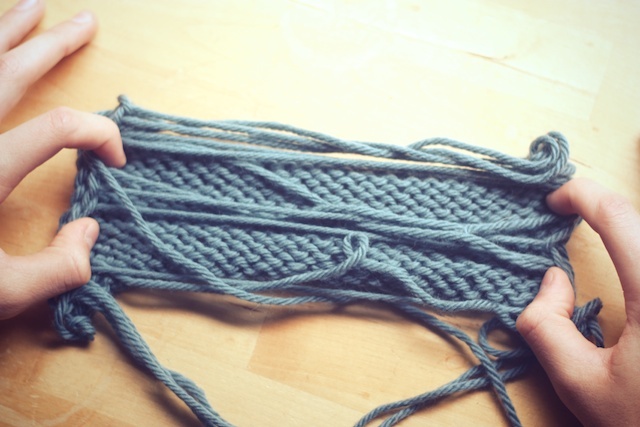 Since I knit tighter when using circulars, I thought this would be wise. 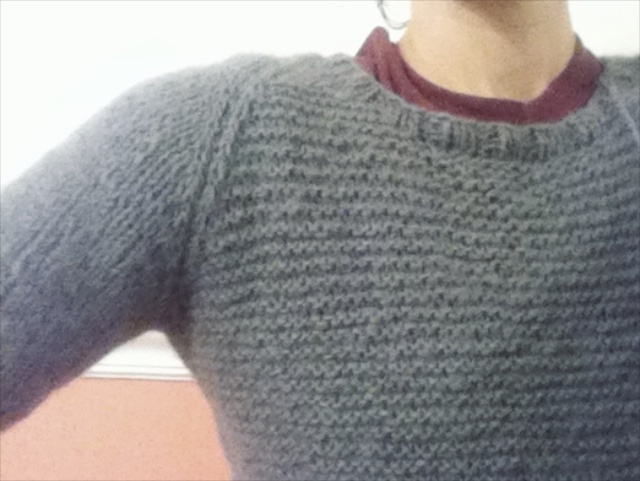 I knit a row, then slid the work down the circular needle to the right side again. I brought the yarn from the left side to the right, leaving plenty of slack, to knit the next row. I just repeated the process over and over. You can see the slack yarn strands aren't pretty, but they served their purpose. I got gauge with size 8 needles. Did you see that? Size 8... that's practically ginormous. I think I can almost certainly say that I'll finish this sweater before the end of the Summer Sweater KAL, if not the end of the week! My Il Grande Favorito is finished and blocking at the moment. Though it fit well when I cast off, I want it to be more oversized, so I'm blocking it out. 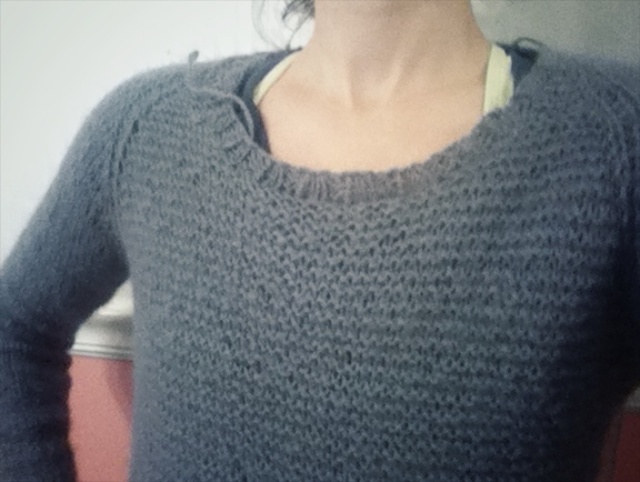 I wasn't sure how big to make the neckline, since I'm hoping for a little growth. I followed the pattern instructions for picking up neck stitches and ended up with a really high neckline like the photo below. Even though I hastily threw it on over a too large t-shirt, it is still too high for this pattern. I snapped these phone pics hastily to compare the two side by side. Once I saw them, I thought it was worth showing here. Picking up 3 out of 4 sts along the sides of the front, instead of every other stitch, made a big difference. Ripping out Reverie yarn was not fun, but I'm so glad I did it. By the way, Emma Welford did a Style Your Knits post about her Just Beachy pattern on the Holla Knits blog recently and I got to put together a polyvore outfit for her. Check it out here. (I love that other people still love Docs as much as I do.) Just Beachy is on sale through August 18th. Grab it because it's a really quick knit and very fun to wear. I love the color of the new sweater. Really looking forward to the finished object. Thanks, Elena. You're right, picking up stitches and seaming seams have to be two of the biggest reasons knitters shy away from patterns.